I have a love/hate relationship with cream eyeshadows. 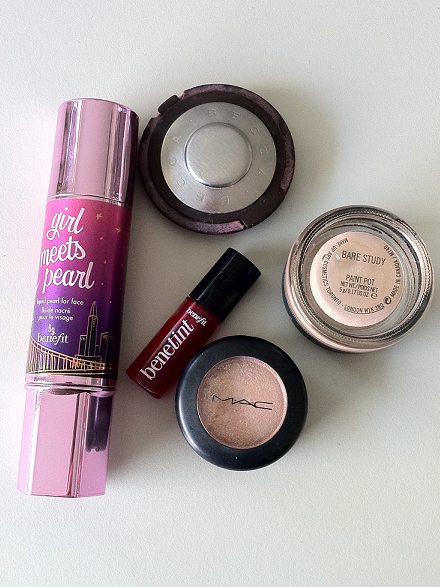 I’m currently in the LOVE phase, and wore MAC’s Bare Study on my eyes every day last month. This is a gorgeous neutral champagne shade that can be worn on its own or underneath other shadow to amplify the colour. I love wearing this underneath my everyday eyeshadow shade (MAC’s Orb) to give it a shimmery undertone. I find that when I wear this on it’s own it has a tendency to crease on my crepey eyelids but if I wear it underneath a powder shadow it lasts for the entire day without creasing or fading. I’ve had this product for quite a while, and although it’s shrunken a little bit in the pot but it’s still as creamy and opaque to apply as when I first opened it. MAC Bare Study Cream Eyeshadow retails for $35 AUD and is available for purchase from MAC online. MAC Ruby Woo, NARS Carthage, Maybelline Mango Diamonds, Lanolips Sunshine & CO Bigelow Rose Salve (or any branded Rose Salve for that matter). Red lipstick is a special occasion makeup item for me. The circumstances have to be right for me to wear any sort of ‘high-maintenance’ makeup product, because I’m a naturally clumsy person. I can only wear red lipstick if I know I’m not going to be eating anything or drinking too heavily. MAC’s Ruby Woo is something of a foolproof red. It has a drier formula than any other red lipstick I’ve worn in the past, which makes it a lot harder to smudge across your face after one too many glasses of wine. 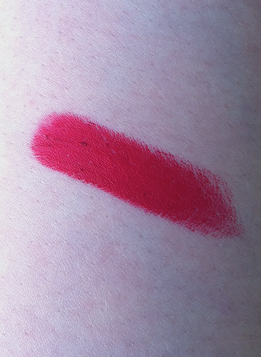 It’s also a perfect blue-toned shade of red that I feel would suit nearly any skin tone. You can see me wearing the lipstick in my FOTN post here. MAC Ruby Woo retails for $36 AUD and can be purchased from MAC Cosmetics. Benefit Girl Meets Pearl – I’m usually pretty loyal to my Benefit High Beam, but I’ve been using this liquid illuminator quite a lot recently. It gives a pretty peachy gold sheen to the cheeks which helps to brighten my corpse-pale face on early winter mornings. Becca Lip & Cheek Creme in Rosebud – Honestly, I can’t wait to finish this blush. Not because I don’t like it but because it’ll be the second blush I’ve ever finished completely and that is a massive achievement. Hooray for me! Benefit BeneTint – I completely forgot that I owned this (possibly because it’s so tiny and I had it tucked away at the back of my makeup storage) but I’m really glad that I dug it out to use it again because it gives the prettiest rosy tint to the lips. It’s designed to be a dual-use product but I stick to using it as a lip stain only. 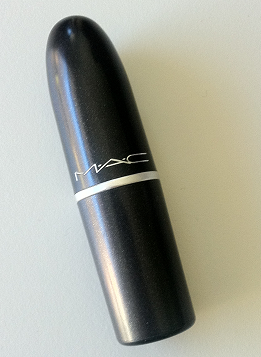 MAC Paint Pot in Bare Study – I wear this on my lids on most weekends when I can’t be bothered putting in much effort. 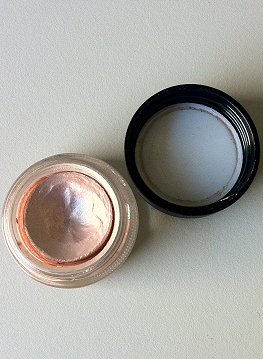 A simple swipe of this across the lids gives a lovely champagne sheen. 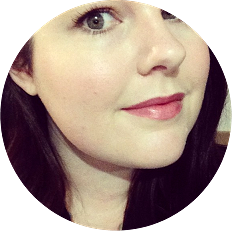 MAC Gleam Eyeshadow – My friend gave me this eyeshadow because it didn’t really suit her makeup style anymore, but it is absolutely perfect for me. 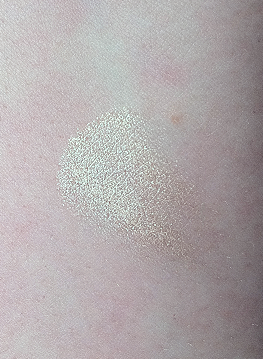 It’s very similar to MAC’s Naked Lunch eyeshadow in that it’s a neutral champagne colour with a satin finish. Which is what around 75% of my eyeshadows are. Nice. 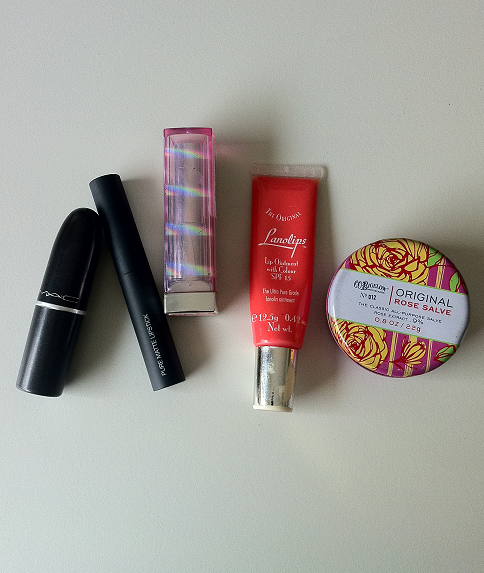 A fitting end to Summer, with my February favourites all bright and shiny and fresh. I used these products consistently throughout the month of February, and now I’m ready for the cooler months to start settling in so I can dig out my favourite Autumn/Winter products. 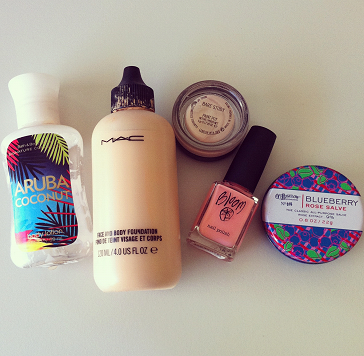 My favourites in February were: Bath + Body Works Aruba Coconut Body Lotion, MAC Face & Body Foundation in N1, MAC Paint Pot in Bare Study, Bloom Nail Polish in Flamingo Sands & CO Bigelow Blueberry Rose Salve.